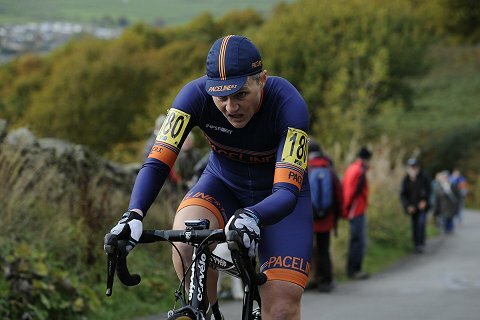 The 2015 National Hill Climb championship was held at Jackson Bridge – a 0.9 miles averaging 11%. It’s a steep unrelenting climb, widely regarded as a classic of the British hill climb genre. For a late October day in Yorkshire, the weather was probably as good as it gets – Mild, dry and a light tailwind up the climb. With good weather, 240 riders, and considerable interest in the pre-championship build-up, there was a good sized crowd up the steep slopes to Tinkers Monument. In the mens event, Richard Bussell RST Sport/Aero-Coach won in a time of 4:15.1. In the women’s event, Maryka Sennema (Paceline RT) won her third title in a time of 5:31.9. Just ahead of Hayley Simmonds, Team Velosport 5:34.2. Simmonds has had a great year of time trials and is just a few weeks back from World road race championship in Atlanta (helping GB to gold). 3rd on the women’s podium was Lou Bates Carnac Planet X in 5.34.9. Less than 5 seconds separated the top 5 women. There were seven men within seven seconds of a podium finish. Never make fun of hill climbers and their marginal gains! Before the race, it was interesting to read Jeff Wright’s (1994 winner on Jackson Bridge) comments in Cycling Weekly that he liked to split the climb into three sections. “I used to ride it in three parts: a start, middle and finish effort – the starting effort is almost effortless and the middle stretch the tough one. If I could keep the cadence than I could go out at the top and finish strongly. I felt pretty good about the race, though didn’t have too many expectations about the result. However, there was also part of me looking forward to the race coming and getting on with it; the race was very hard to predict with it being too close to call – I could see a personal finish of anywhere between 1 and 10. I got there nice and early and had a bowl of pumpkin soup in the fascinating surroundings of the Oil Can Cafe and their innumerable bikes and car paraphernalia. It’s hard to get much of an appetite before a big hill climb. You don’t want to me lurching up a steep hill with a stomach full of fried eggs. So I ate the soup and nibbled at the bread. With the rare luxury of a some team-mates from Sri Chinmoy CT to hand out wheels and drinks, I had a good warm up and everything went pretty well. At the start I set off at pretty good pace, I actually felt a little under geared for first 100 yards – but I was committed to using the same gear all the way to the top of the first section. The first hairpin was quite fast and rather than go wide, I took a slightly straighter route than previously. The next left-hander is the hardest part of the course, as you have to dig deep to keep the momentum up. After that first section was over, I took a little recovery, before the middle section really kicked in. At this point (1.30 into race) there’s no holding back and it was about trying to keep a strong momentum all the way to top. I felt I was keeping a relatively good pace, though it’s always hard with the changing gradient. I finished really exhausted with a feeling I had done good race, good pacing and good effort. My mind was virtually blank throughout the race, and though it was painful, seemed to go incredibly quick. I then lied down on road and contemplated the emptiness of something. For a minute or so I was under the mistaken impression that I had won. I have to admit, it was partly my fault. The second reason is that in a pre-Tejvan incarnation – my name was actually Richard. I sometimes get called it, very occasionally old acquaintances may come up and say – are you Richard? So there I was top of the hill, with people taking photos of my bike and the like. I didn’t really feel any euphoria, I was mostly confused about what my name was. By the time, I was starting to think maybe after all I had won, the mistake was realised. In the end, it was not even a podium finish that I would have really liked – but 6th place. It’s a tough just to miss out on a podium when you get so close. However, the one, not inconsiderable, consolation was on one occasion upsetting the pattern of near misses and making it to the very top. So I can’t complain, there are plenty of others in the same boat of just missing out. That’s the nature of the championship. On the one hand, I did a good race, 6th is a relatively good result, especially for someone who will soon be propping up the veteran category – and especially with all the young whipper-snappers making the kind of rapid progress, only the folly of youth can give you. Overall I enjoyed the championship. There is something very special about the national hill climb championship; an atmosphere like no other – even if at times it’s pretty painful. On the positive side, I had a good meditation in the car before hand, we found a nice post race restaurant up the road afterwards. And, I also avoided the temptation to cut my expensive Shimano Dura Ace brakes in half to save another 100 grams. So at least I don’t have to buy a new pair. Most importantly, the race was really a great buzz. Thanks to all spectators and organisers from Yorkshire District. 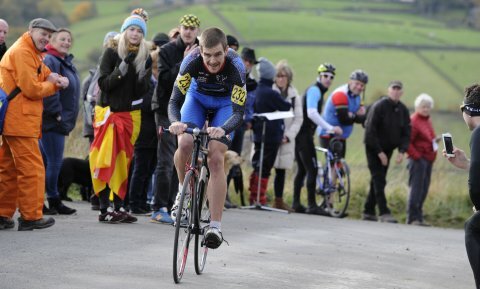 2016 will be a hill climbers classic on Bank Road Matlock. So all I have to do is put on 5kg over winter and reinvent myself as a lightweight sprinter. You heard it here first! Congratulations, that’s another great ride in the big one. I was quite surprised by the result toady, some ride from the winner. Interesting looking at the split times on the ctt results site. Looks like you paced it well and finished stronger than most. Thanks for this post, Tejvan. Like all of your posts, it’s fascinating for a Sunday morning rider to get an insight into competitive racing. Keep them coming please! I would echo what Nick G says, it’s always fascinating and endearing to read your articles. This one and the follow-up ‘Not everyone can be Eddy Merckx’ tell us more than usual. You are in the great position of being competitive, and having won this title, so sixth (and the prospect of never getting faster, likely slower) is a blow. But you “touched the sky” and took taken possession of that striped jersey so you’ve done something the vast majority can never achieve. Thanks for giving us an insight into the highs and lows, both are valuable aspects of sport and life. I’m sure your website will have contributed in some way to the resurgent interest in the sport of cycling uphill.